Happy February! Between the Academy Awards to the launch of America’s first all-Asian starring cast on TV since the 90s, this month has been full of news and events. Read on to find out the latest in Hollywood. “Tonight we celebrate Hollywood’s best and whitest, sorry… brightest.” It was a telling joke that alluded to how the Academy Awards is consistently a white celebrity-studded affair. And this year was no different. The awards show, however, did have its Asian representation in small ways. 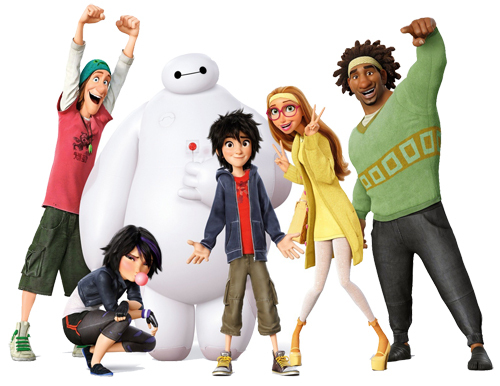 Disney animated film “Big Hero 6” won the category for Best Animated Film Feature. The movie follows the story of a young robotics genius named Hiro Hamada who forms a superhero team to fight a masked villain. “Big Hero 6” features the starring voices of Asian American teen actor Ryan Potter and actress Jamie Chung, best known for roles from the drama film “Sucker Punch” and “The Hangover” franchise. “The Tale of the Princess Kaguya” from Japanese director and animator Isao Takahata and Japanese producer Yoshiaki Nishimura, was also nominated for the same category. Other relevant nominations from this year’s Oscars include: “Last Days in Vietnam,” a documentary that explores the final weeks of the Vietnam War, was nominated for Best Documentary Feature. Beijing-based director Hu Wei, along with French producer Julien Féret, had a short titled “Butter Lamp (La Lampe Au Beurre De Yak,” in contention for Best Live Action Short Film. Shot in Tibet, the 15-minute film explores the preservation of Tibetan heritage in midst of rapid globalization and modernization. We’ve previously talked a good deal about the ABC sitcom “Fresh Off The Boat,” which premiered earlier this month to great fanfare. Based off an autobiography of the same name from celebrity chef and television personality Eddie Huang, the show stars actors Randall Park, Constance Wu, and Hudson Yang. The accompanying promotional ad showed illustrated ethnic people in stereotypical hats, such as a turban, cowboy hat, and a sombrero. Not sure why ABC’s social marketing team, or perhaps the agency they hired, thought this would be a strategic move for promotion. Such a misguided marketing tactic. “Fresh Off The Boat” isn’t the only show with Asian Americans to make waves on television recently. Over on Disney Junior, a cable channel from Disney aimed at kids 10 and under, a new animated series titled “Miles From Tomorrowland” recently debuted. Featuring an Asian American family —that is, leading characters of Asian and half-Asian descent — the animated space adventure series follows in the footsteps of “Big Hero 6” by using science and technology as major driving themes for their characters and plotlines. Not only does “Miles From Tomorrowland” introduce and promote diversity to young viewers — a concept that was unfathomable when I was growing up — the show’s executive team hopes to encourage a whole generation to become interested in the fields of science, math, engineering and technology.